The time between each frame is .08 seconds. Britta Steffen led off the German 4 x 100 m freestyle relay and broke the existing world record with a time of 52.2 as her split. The imagery in this sequence is not clear because of the poor quality of the original video recording. However, it should allow some appreciation for what the swimmer does to make her the dominant female sprinter of this time. Frames #1 through #3: Britta Steffen reaches long forward with the just-entered left arm. The right leg kicks shallow. The right arm continues to apply a backward propulsive force. The amount of force in this latter phase of the right-arm stroke is less than optimal because the shoulders have flattened due to the left arm's entry. That means the last third of the propulsive stroke reduces the role that is possible for the external rotator muscles of the shoulder. If the recovering arm had been "opposite" the pulling arm, the shoulders would have stayed angled longer allowing both the internal and external shoulder rotator muscles to apply extended full force to the adduction of the upper arm. However, as long as the swimmer maintains forward velocity with the "weaker" form of pull, the loss in extended acceleration will be minimized. The swimmer has excellent streamline. In Frame #3, the foot of the right leg "drags" possibly to counteract forces created by the right arm as it prepares to be repositioned. Frame #4: As soon as propulsion is completed with the right arm (it has exited), the left arm begins to be repositioned to apply propulsive force. There is a small inertial lag that occurs here because no propulsion has occurred. The left leg is positioned to kick. Frame #5: The left leg kicks to counterbalance the exited right arm. The left foot "drags" to create more vertical force. The left arm continues to be repositioned but is possibly held too long forward (too much emphasis?) because no appreciable propulsion seems to have occurred. The main forces off this arm to this point have been vertical. Some abduction of the upper left arm has occurred. Frame #6: The left arm presses down and back with considerable force (judging by the volume of drag turbulence following the arm). The right leg kicks to counterbalance the increased vertical force component of the propelling arm which occurs in this early phase of the stroke. The left foot continues to drag in a non-streamlined manner. Frame #7: The left arm provides almost total force backward. The internal and external shoulder rotator muscles at this stage are contributing to adduction of the upper arm. The right leg completes its shallow kick. Frame #8: The left arm adduction is almost complete. The left hand/forearm combination has retained a vertical orientation and still applies considerable horizontal force. The right arm has entered causing the shoulders to flatten. Frame #9: The left leg kicks to counterbalance the entering right arm and also, to add some rotation to the hips so that the left hip will move up and away and reduce the degree to which the exiting propelling arm has to deviate to the side. The entered right arm begins to be repositioned. Frame #10: The right leg kicks as the left arm presses down and forward. The resistance caused by the arm action can be seen by the turbulent pocket that falls away from the wrist and arm to the surface behind the swimmer's head. The left elbow has exited. Frames #11 and #12: The right arm continues to be held forward and to press down. The left arm continues to recover and the right shoulder is lowered as the trunk rotates to the left. Frames #10 through #12 show no propulsion from the right arm which constitutes an unfortunate inertial lag. Frames #13 through #15: The propelling right arm appears to be quite deep, but that may be a visual distortion due to the camera angle. The whole of the right arm provides the propulsive surface as evidenced by the drag pocket in Frame #14 extending up the arm. The stroke cycle begins again in Frame #15. 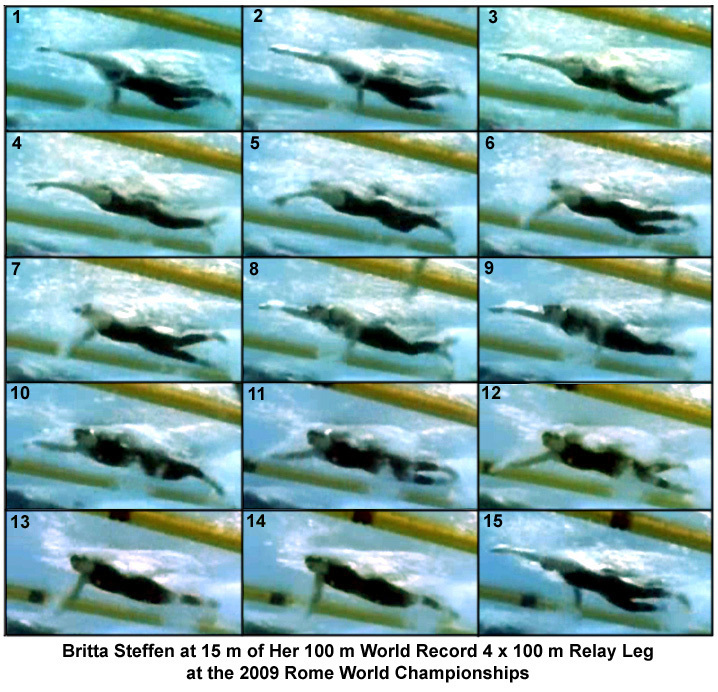 While Britta Steffen is the best crawl stroke swimmer in the world, the existence of brief inertial lags is troublesome. Those inertial lags could be removed simply by deft repositioning of the eventual propulsive arm. One feature that could be emphasized would be the most rapid repositioning possible to have the hand/forearm as vertical as possible before any significant abduction of the upper arm. Britta Steffen's stroke appears to emphasize reaching forward rather than focusing on release velocity. An exaggerated stretch forward is frequently advocated by European coaches but it is not fathomable as to why. The end of the stroke is more important than the start and it is that which should be emphasized. The start only involves positioning. Exaggerating extra length forward likely would introduce more inertial lag as well as place the limb in an unnatural position from which extra movements have to be made to return the limb to an effective force-producing position. Why only a few coaches emphasize accelerating the propulsive arm to achieve the greatest velocity before initiating the recovery is not known. It is believed that Britta Steffen still has elements of her stroking that could be improved, which would then be reflected in even better performances.